Companies often struggle for need to have fast, secure and scalable IT infrastructure, in order to cope up with their Functional Testing and Load Testing requirements. But they often lack the ability to have this setup in-house due to high capital investment that goes into the growing needs of the IT infrastructure, staff and the expertise to administer. Also traditional in-house testing does not simulate real-world traffic which is must for Web testing. Cloud Services allows companies to automate and speed up the Load Testing and Functional testing of their web application using real-world user traffic over the Cloud platform. Cloud Services operate a SaaS (Software as a Service) model, so there is no need to invest in any hardware, software or consultancy; Cloud Services provide all you require for web testing, leaving you to concentrate on your core business needs. We have expertise in setting up Cloud Services in a custom way as per your needs. We have our own products to automate Functional Testing and Load Testing of your application, but we can work with any product or platform of your demand. Get in touch with our sales team sales@AppPerfect.com to know more about how we can help you take your business to the next level with our Cloud Based Services. AppPerfect supports Cloud Based Services for web application, wherein we can functional test and load test your web applications using real traffic over the Internet from our servers located world-wide. Using our Cloud Services framework you can test your web applications on different browsers, hardware and operating systems combinations. We can design, develop as well as execute your tests using our servers over the cloud infrastructure. Fully Managed: We will design, develop and execute your tests using our servers. We will assign a dedicated engineer who is a domain expert and work with you every step of the way. On-Demand: No hardware, no software, no training, no scripting. Just specify requirements and we will do the rest. Only test when you are ready and pay only for what you test. Scalable: You can test your Web application from either a single location or locations world-wide. From 1 user to 1,000,000 users. From 1000 hits per hour to 1,000,000 hits per hour. Our hosted cloud infrastructure can scale to whatever you need. 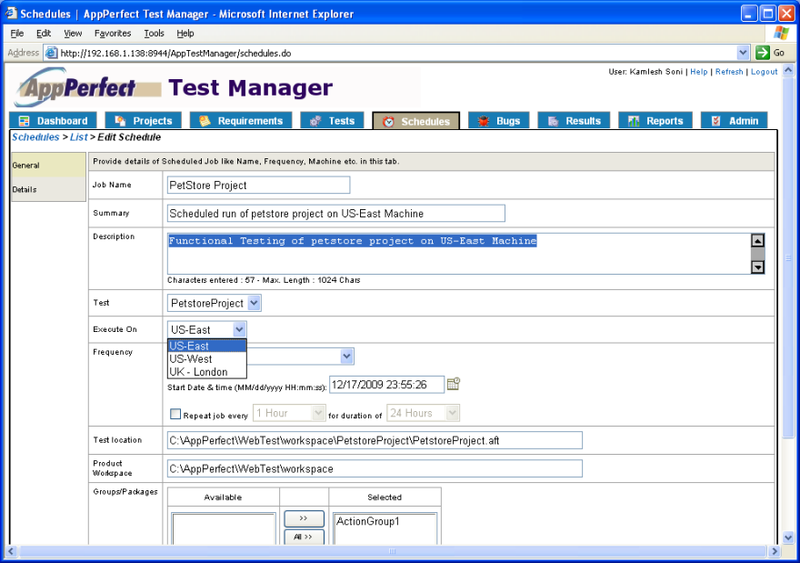 Designing and Recording Test Script: You need to first create a test script using AppPerfect client product. In case you are interested in Functional Testing then record the functional test for your web application using AppPerfect Web Test. In case you are interested in Load Testing then record the test for your web application using AppPerfect Load Test. You can either create test scripts locally using AppPerfect products or can take use of our hosted services, where you can just specify your testing requirements and we can design and develop test scripts for you. Distributed Testing: AppPerfect allows you to distribute your test over multiple machines over Cloud to simulate real-world conditions while testing web or intranet sites, client-server and other multi-tier applications. Testers can easily configure the list of machines on which Test Script should be executed. Testing results from all machines are accumulated into a single report for easier analysis. 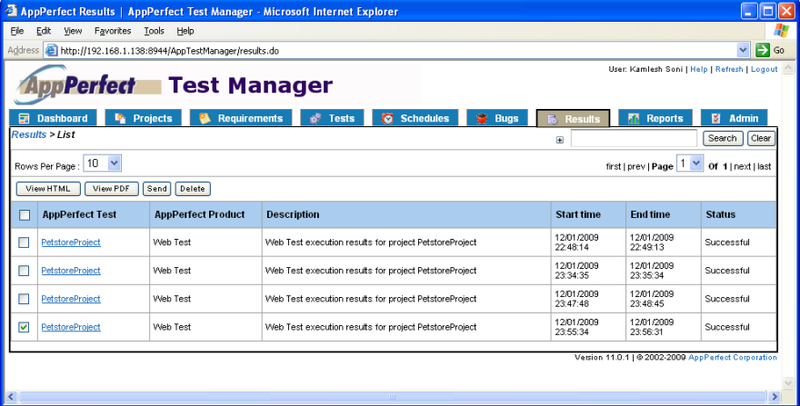 To configure execution of test on multiple machines select Project > Properties menu option. It will launch the Project Properties wizard. Select the "Distributed Testing" step where you can configure to run Test script simultaneously on multiple machines. Distributed testing is performed using AppPerfect's service running on the remote cloud machines. For more details refer to Distributed Testing tutorial. Connecting to AppPerfect Cloud Environment : AppPerfect provides a hosted Test Management server with a Web-based UI for managing and executing tests over Cloud servers. Once you are done creating scripts locally, you can use this interface to upload the test scripts to our test management server. Once you register for Cloud Services with us, we will provide you with the connection details for accessing our hosted Test Management system. You just need to configure the connection settings for the Test management system to upload the scripts. To configure the Test Manager connection select Tools -> Options -> Server Connections -> Test Manager Settings and provide the host:port information which will be provided to you once you register with us for Cloud Services. 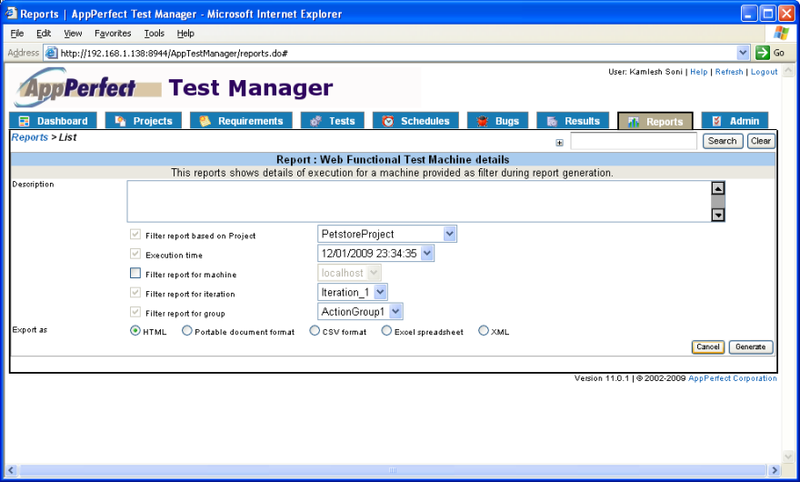 Uploading recorded test script to remote AppPerfect Test Management System : Once the connection is configured, you can save your recorded test to the Test Management system using "File -> Export to Test Manager" option. This will take care of uploading your test script to the remote Test Manager server. 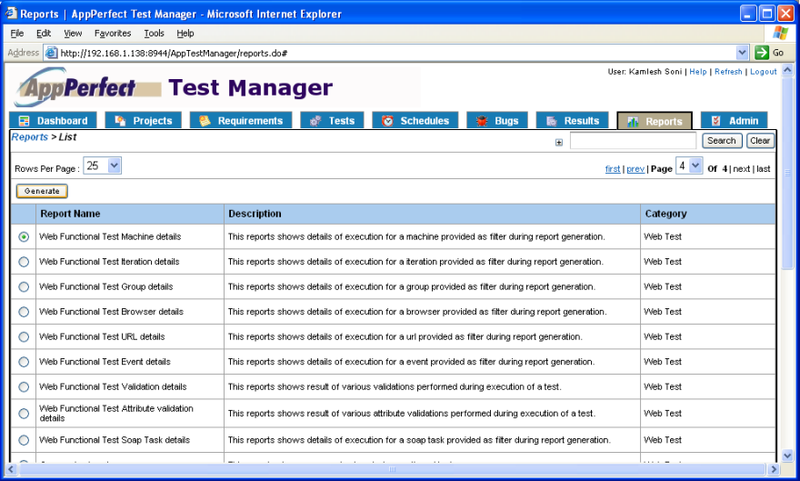 Accessing Remote Test Management System: You can view the results of test execution remotely at your end via our Test Manager system. 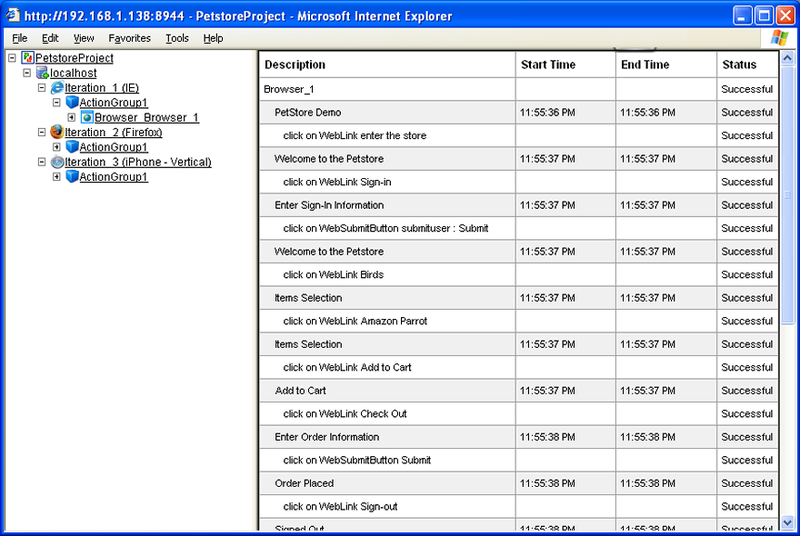 It has a web-based UI which you can access using any web browser at your end. Just start a web browser and type the url http://host:port/AppTestManager where TestManager host and port information will be provided to you once you register for Hosted Testing. This will load the Test Manager UI. You will be asked for User Name and password. Provide the credentials which you will receive on registering with AppPerfect Hosted Testing. 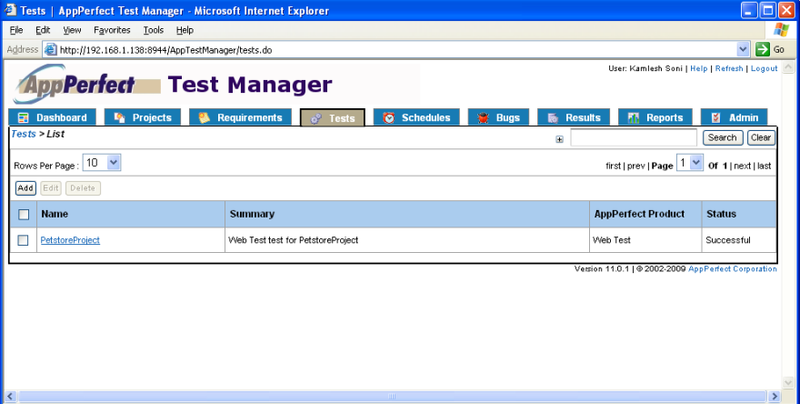 Select the Tests tab to view the Tests created for your web application. Scheduling Test Execution over Cloud environment: You can schedule the execution of test to run it automatically at desired time. You can configure it to run on specific machine on Cloud network and can also configure it to send email notifications once test execution is over. 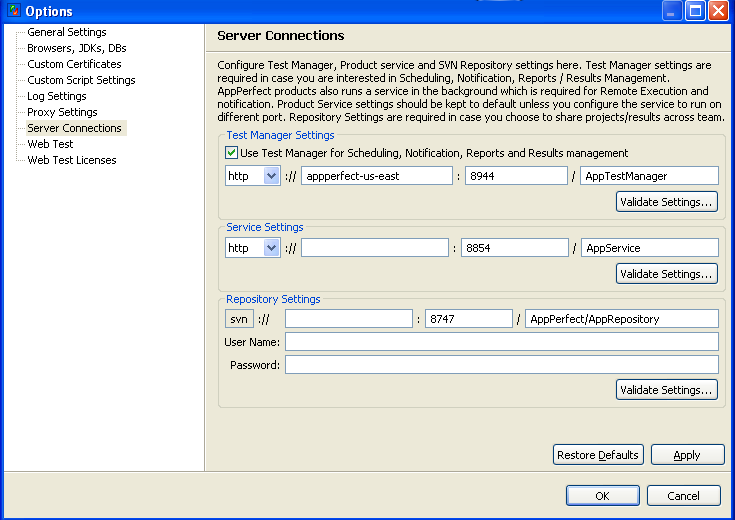 Select the Schedules tab and add a new Test schedule to schedule the execution of test automatically at desired time. Viewing & Exporting Test Results : You can view results of your test execution on selecting the Results tab. You can view details of result execution for each of the step performed during test execution. You can also export the results to HTML or PDF formats. Click on "View HTML" button to export the result in HTML format. In case of test failures, the exported result showing details for each failed step can be passed on to your development team for further analysis. Comprehensive Reporting: Get detailed reports after every execution to track end-user experience. Our reports are clear, concise and actionable. We provide lots of System reports which are predefined report designs that are shipped with AppPerfect. User can filter data shown in these reports based on his requirements. Each report can be exported into HTML, PDF, XLS, CSV and XML formats. The list also includes trend analysis reports. You can view all the Reports on selecting the Reports tab. To generate a report, select the report and click "Generate" button. You will get a view containing required filters for the selected report.Select the format in which you want to export the report and click Generate button.